When Yogyakarta tour package offers various destinations to visit and numerous things to do, witnessing Nguras Enceh, one of traditional custom ceremony in Yogyakarta, must be a good idea. Among a few custom ceremonies that are available in this city, Nguras Enceh is considered as one that always attracts tourists to see. Learn more about this cultural attraction below! Besides the magnificent Borobudur Temple and the breathtaking Timbang beach, Yogyakarta also has a cultural attraction that is worth to watch. Adding Nguras Enceh to your Yogyakarta tour package is for sure a great choice. However, you must note that this event is not conducted by locals every day. So, keep reading to learn further about this ceremony. 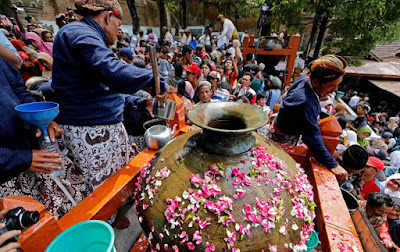 Nguras Enceh Ceremony is actually a yearly activity which aims to change the water inside a special Gentong or Enceh (a traditional water container in Indonesia) with fresh water. The Enceh here is considered as an extraordinary Enceh because it is one of the heirlooms of the Imogiri Kings. As a yearly event, you can’t find it on your Yogyakarta tour package every day. There are actually four Enceh which are placed in Imogiri and each of the Enceh has a name including Kyai Mendung, Kyai Danumaya, Kyai Danumurti and Kyai Siyem. All the Enceh here are present from neighboring kingdoms such as Turki, Palembang and Aceh. There is no doubt that visiting Imogiri during your Yogyakarta tour package for this reason is worth your time. Then, how is the process of this traditional ceremony? The ceremony is typically started around 8 am in the morning and it begins with Tahlilan (prayer in Islam). It usually takes place at Masjid Pajimantan (Pajimantan Mosque) which is located inside Imogiri complex. For your Yogyakarta tour package, this ceremony will a lot more about learning the Islamic culture in Imogiri. After that, the agenda is followed by refilling the water of the Enceh. There is a lot of ritual offerings provided as well before the primary ceremony started. The offerings include nasi gurih, ingkung ayam, ketan, kolak, pisang raja and many other traditional foods from Java. We can say that this part will be a thing you shouldn’t forget about your special Yogyakarta tour package. The ceremony is held yearly specifically during the Javanese month of Sura. It is conducted on certain Friday or Tuesday during the Sura Month. Since you need to come at the right time for watching the Nguras Enceh during your Yogyakarta tour package, the best way you can do to watch it is by discussing it first with your tour company.